SEO is a term that is extensively used but not widely understood. The practice of Search Engine Optimization is intended to improve your rankings on the various search engines which will lead to increased traffic to your site. SEO is important because search engines are important. Most websites, especially newer ones without an established audience, will receive 50% or more of their traffic from search engines. Even established websites with a large audience of repeat visitors covet search engine traffic because it brings in new customers. Most of the “SEO 101” or “SEO Basics” articles that you find were written in 2009 or earlier. And while some of the basic components of SEO have not changed, the entire SEO landscape has changed dramatically over the last year. New ranking factors have been introduced, Google’s Panda and Penguin updates have been rolled out, and many new tools and techniques have emerged. Each of the search engines performs these functions in slightly different manners. 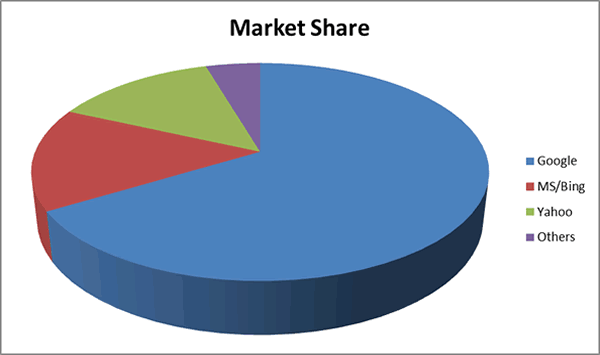 The search engine marketplace is dominated by the three major search engines (Google, Bing and Yahoo) with Google having an approximate 66% share and Bing and Yahoo at 15% and 14%. A fundamental part of SEO 101 is the anatomy of Google’s search results. The screen shot below shows a recent search for the term “SEO”. There are several interesting items that you can glean from looking at the search results. 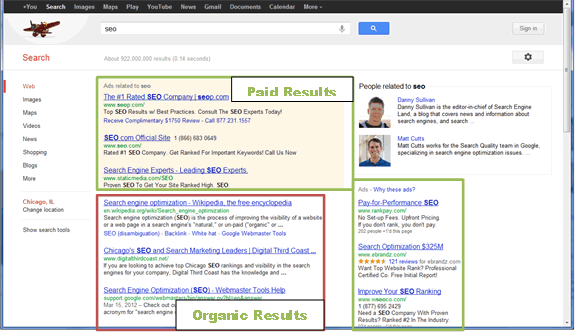 The first is the concept of Paid Results vs. Organic Results. Each of the search engines has their own advertising program that allows advertisers to pay for showing their ads on search results pages. These paid results (outlined in green) are usually shown above and to the right of the organic results (outlined in red). These advertising programs are sometimes referred to as PPC (Pay Per Click Programs) because advertisers typically only pay if a user clicks on their ad. Google’s PPC program is known as AdWords. The organic results are the “natural” results shown by the search engines after their algorithms have calculated what the most relevant result is. The second concept of SEO 101 to understand is not all search results are the same! This concept surprises many people. In their never ending quest to provide the most relevant results to your search query, Google will alter their search results based on what they know about you. And believe me, Google knows more about you than you think! 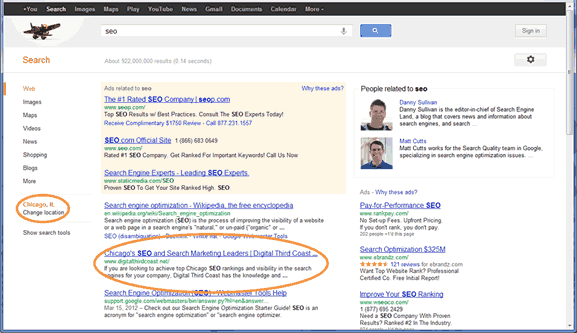 In the example below, I show two identical search queries for the same term “SEO”. In the first result, Google believes that I am in Chicago, IL which results in the second result being a local Chicago SEO shop. In the second screen shot, I have changed my location to Dallas, TX. In this case, the Chicago SEO shop result goes away, and a new Dallas SEO shop moves up to the third position. Over 90% of the time Google will know your location either because you are signed in to a Google account or from your computer’s IP address or the Wi-Fi access points that you use. 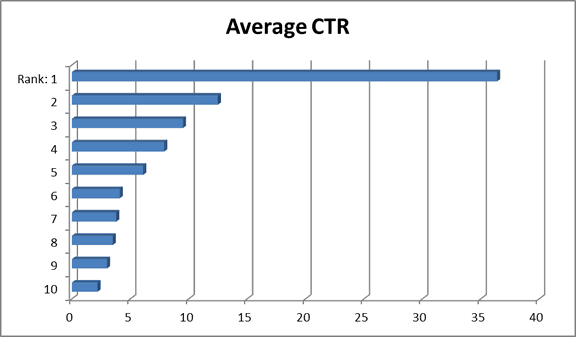 The chart below shows how CTR dramatically decreases as your search engine ranking decreases. A number 1 position in the rankings yields a 36.4% click through rate, while a number 10 position only yields a 2.2% click through rate. The importance of obtaining a high ranking cannot be overstated. Each of the search engines has their own proprietary algorithm that determines how they rank their search results. These algorithms are closely guarded corporate secrets that only a few select inside employees know precisely how they work. The rest of us are left to piece together details from patent applications, public disclosures and empirical evidence. From a SEO 101 perspective, all of the search engine algorithms work in the same way: they determine what your web page is about and then they determine the quality/authority of your web page with respect to the search phrase. The first step in this process for a search engine is building an index of web pages. To accomplish this, the search engine needs to find your page and determine what the page is about. All search engines use automated robots (sometimes referred to as “spiders” or “crawlers”) to make their way through the internet and find/index web pages. These crawlers will go to a website and find their way from page to page by following all of the links they find. Search engines deploy massive computer resources to index web pages so that they can deliver the most relevant results. The estimated size of Google’s index is 45 billion web pages. Once Google has found your webpage, the next step is for it to determine what the web page is about. Google and the other search engines will analyze the content of your web page to determine what the page is about. They will pay particular attention to the title and identify key phrases that are more frequent on the page or appear higher up in the page. These algorithms are very sophisticated, and very good, at identifying what your page is about – and identifying if you are trying to “spam” the results by overusing a key phrase (keyword stuffing) or other techniques. The search engines will also pay attention to how both internal links and external links refer to your web page. The anchor text (the link label or clickable text in a link) helps the search engine identify the key topic of you web site. If a high percentage of links to this page use an anchor text of “SEO 101”, then there is a good chance that the focus of this web page is SEO 101. Once the search engine has compiled an index of web pages, the next step is determining how to rank those pages based on a search query. If you search for “SEO” in Google, how does it determine which result to put first, second and so on. 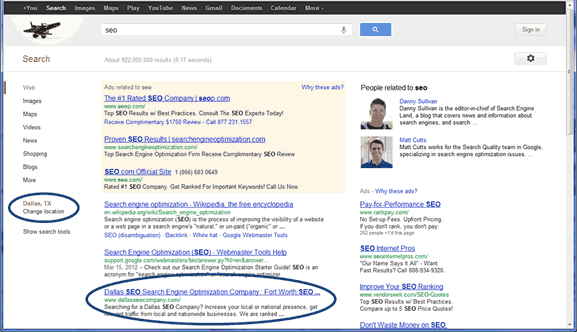 To accomplish this, Google and others attempt to determine the importance of a page in relation to the search phrase. In the original Google algorithm, Google relied heavily on the links that pointed to a page. The reasoning was that if many sites pointed to your page, then your page must be important. Google also weighted their algorithm so that if you had more important pages linking to you, then your page was even more important. This factor is still important for all of the search engines. They all view links to your web page (especially from “authority sites”) as a vote of confidence. Site Engagement – Google attempts to determine how satisfied a user is with a search result by seeing how much time they spend on the site (engagement). If a user clicks on a search result and then immediately returns to Google’s search results, this indicates to Google that the user did not find the search result to be relevant/useful. Quality Content – Over the past year, Google has made significant changes to its algorithm in an attempt to rank quality sites higher (by essentially penalizing low quality sites). Google’s Panda algorithm (originally released in February 2011) punished low quality (“scraper”) sites who had thin content or content that was “scraped” from other sites. Google implemented a “page layout algorithm” in January 2012 that punished sites that had too many advertisements “above the fold”. Webspam – In April 2012, Google released its Penguin update. The main goal of the Penguin update was to penalize websites that participated in black-hat SEO techniques designed to artificially improve a site’s search engine rankings. The Penguin update penalized sites who used on site tactics such as keyword stuffing or link cloaking. In addition, the update evaluated a site’s “link profile” (a view of all the links pointing to a web page) to try and determine whether a site was participating in any link schemes that would be indicated by signs of unnatural linking. For example, it has been widely reported that web pages that have a lack of diversity of anchor text in their link profiles have been penalized. Social Networking – Recent empirical evidence suggests that Google and the other search engines are utilizing “social signals” as a factor in their ranking algorithms. Social signals may include Facebook Shares/Likes/Comments, Tweets or Google+ mentions. In Part 2 of this article we continue our discussion of SEO 101 by delving into keyword research, on site-SEO factors and off-site SEO factors.